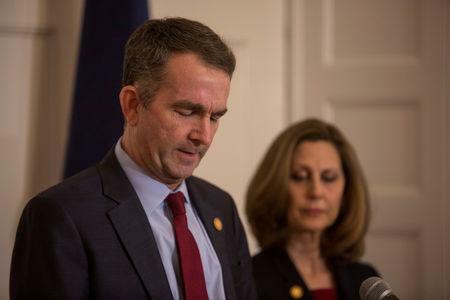 RICHMOND, Va. (Reuters) - Virginia Governor Ralph Northam made his first public appearance on Saturday since defying calls a week ago to step down over a racist yearbook photograph, as his potential successor, a fellow Democrat, resisted growing pressure to quit over sexual assault allegations. Fairfax, who is African-American, has denied both claims and called them a "coordinated smear campaign." He has been as defiant as Northam in refusing to step down. The governor's own troubles began when a racist image from his medical school yearbook went public on Feb. 1. The week's political chaos surrounding Virginia's top two elected officials stretched down to the second-in-line to succeed Northam, Attorney General Mark Herring, 57, who admitted that he, too, had once darkened his face to imitate a black performer. Calls for Fairfax to step aside have come from state House and Senate Democrats, the Legislative Black Caucus, former Democratic Governor Terry McAuliffe, Virginia's two U.S. senators, Tim Kaine and Mark Warner, also both Democrats, and several potential Democratic presidential hopefuls.